COLUMBIA, S.C. (AP) — Mississippi State coach Vic Schaefer couldn’t have been more ready to face South Carolina, and he showed his passion when his players needed it. Schaefer loudly protested a third-quarter foul on Bulldogs guard Andra Espinoza-Hunter, coming up the court and drawing a technical with his team trailing 39-34. Mississippi State’s players showed they shared Schaefer’s fire. 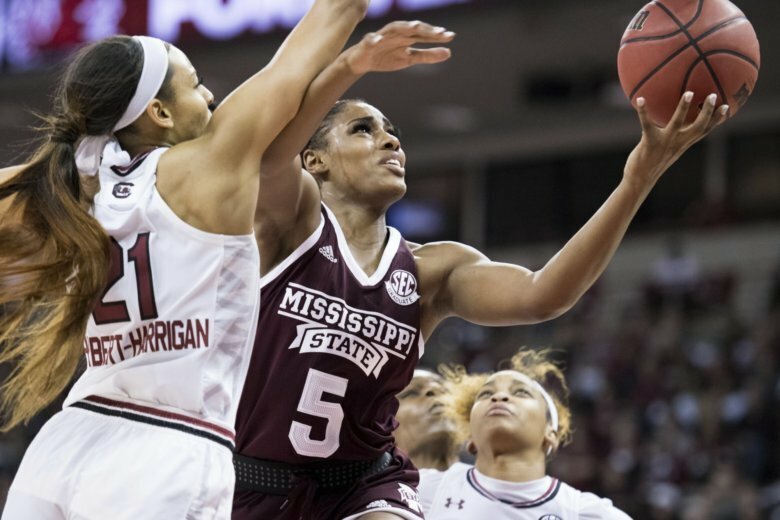 Teaira McCowan had 18 points and 17 rebounds to help the fifth-ranked Bulldogs rally from 10 points down and hold on through a wild finish to defeat No. 14 South Carolina 68-64 and win the Southeastern Conference title on Sunday. The Bulldogs (27-2, 15-1 SEC) were up 11 points with under seven minutes left before the Gamecocks rallied to 66-64 on Tyasha Harris’ steal and breakaway layup with 42.7 seconds to go. But it was Mississippi State that made the big plays after that. Anriel Howard got the rebound after teammate Jordan Danberry missed two free throws on the next possession. Danberry got the board when Espinoza-Hunter missed a short jumper with 10 seconds left. And the 6-foot-7 McCowan picked up Danberry’s missed foul shot with 2 seconds to go to secure the win for Mississippi State. McCowan was not much of a factor in the first two quarters with just four points and two fouls. Schaefer put her back in right before the half. “He told me to be smart and do what an All-American does,” she said. McCowan responded with her 24th double-double this season. She finished with 44 points and 41 rebounds in Mississippi State’s regular-season sweep of the Gamecocks (21-8, 14-2). The Bulldogs had wrapped up the No. 1 seed for next week’s league tournament with Kentucky’s win over Georgia. South Carolina led 39-32 at halftime, holding Mississippi State to its lowest-scoring first half this season. But behind McCowan, the Bulldogs charged in front with a 17-4 start to the third quarter. McCowan, the likely SEC player of the year, had eight points during the stretch and eventually wore down the smaller Gamecocks — who no longer have 6-5 A’ja Wilson to match up with and slow down McCowan. Howard had 13 points and 16 rebounds while Espinoza-Hunter had 17 points for Mississippi State, who beat the Gamecocks twice in a season for the first time since 2009. Harris led the Gamecocks with 20 points while Mikiah Herbert Harrigan had 13 points and 11 rebounds. Mississippi State entered with a share of its second straight SEC championship. It also had a recent history of falling to the Gamecocks in some major moments, including a 67-55 loss to South Carolina in the 2017 national championship game. And the Bulldogs struggled to keep up in the first two quarters as South Carolina used a 25-10 run during a 10-minute stretch to open a 32-22 lead. Mississippi State: The Bulldogs got the outright title they wanted along with some confidence they can outmuscle the Gamecocks in a hostile environment. It might prove handy come next week should the teams meet in SEC Tournament, which is being played in Greenville, about two hours north of Columbia. South Carolina: The Gamecocks fought hard, but had no answer for McCowan or Mississippi State’s rebounding. South Carolina was outrebounded 51-37. Schaefer’s technical foul could’ve put the Bulldogs in a bigger hole. Instead, South Carolina’s Bianca Cuevas-Moore missed both free throws, and the Gamecocks could not score when they got the ball back. With a second straight SEC regular-season crown secure, Mississippi State hopes to double up at the SEC Tournament next week. The Bulldogs have lost the past three tournament championship games to South Carolina. Schaefer said it’s too early to worry about anything except their quarterfinal game Friday. South Carolina coach Dawn Staley took responsibility for her team’s poor play in the third quarter, when it was outscored 19-8 to go from up seven to trailing 51-47. She said she had players in different sets that led to some confusion. The Bulldogs eventually took a 62-51 lead with 6:38 left before South Carolina rallied. Both teams play in the SEC Tournament quarterfinals on Friday.